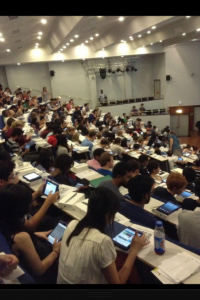 The School issued iPads Mini to students in years 5 and 6 of the MBBS course at the beginning of the 2013/14 academic term. iBooks have been developed in order to standardise the delivery of course related materials for the different clinical attachments. Once the iBooks are downloaded on the iPads, they can be accessed offline. The iBooks offer a range of interactions designed by academics to make the learning experience more engaging for students. The image below shows some of the iBooks developed for years 5 and 6. Students can download the iBooks via the Mobile Device Management System (MDM): AirWatch Secure Content Locker provided by ICT. Overall, the feedback received from academics and students has been very positive. They like the fact the iBooks can be accessed off-line and they provide a lot of engaging interactions. Electronic submissions and signoffs have been piloted using the eForms iPad App. It allows submissions of assessments (end of attachment, DOPS, etc.) via student iPads. The system allows clinicians to electronically sign forms online/offline and to receive an electronic copy of the submissions via email. Students also receive confirmation via email and administrators can track submissions online. SharePoint has also been piloted for electronic submissions in years 3, 5 and 6 to accommodate open-ended questions requiring formatting as well as submitting attachments (PDF, Word documents, etc.). In total, over 100 electronic submissions have been introduced in years 5 & 6. Feedback so far has been positive although some students have expressed preference for paper based submissions. iCalendars have also been deployed for some clinical attachments (nearly 100 iCalendars), allowing students to access their calendars/timetables on their iPads and/or smartphones. Due to the positive feedback received from students on the use of iCalendars, the School has decided to implement iCalendars for all clinical attachments from January 2015. We have also received positive feedback on the use of virtual clickers especially during the Pathology course. The students have also been very receptive to the use of the BMJ Best Practice App provided by the library. 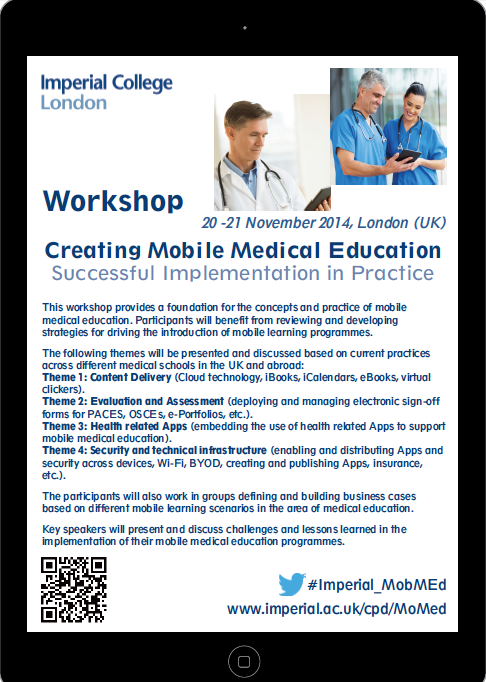 The work done so far on the Mobile Medical Education Pilot Project provides evidence of the benefits in the provision of electronic submissions, iCalendars and the distribution of course and learning related materials on the students’ devices via iBooks. The digitisation of clinical related assessments (e-forms) provides a more efficient and robust mechanism to audit assessment submissions during attachments. A Working Group will be setup to evaluate the iPad pilot and make recommendations to the School on the way forward in relation to the School’s Mobile Learning Strategy. The recommendations will be made available by February 2015. A CPD course: ‘Creating Mobile Medical Education: Successful Implementation in Practice’ has been setup based on the experience gained during this project at the School. All the implementations carried out as part of this project will be demonstrated during the course. 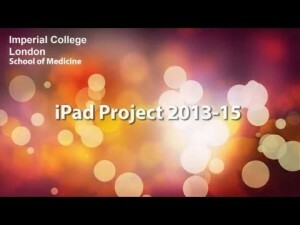 The Faculty of Medicine will be piloting a project issuing iPads to students in years 5 and 6 of the MBBS course at the beginning of the 2013/14 academic term. All the course learning materials will be accessed via Blackboard Learn. Students on placements will be able to readily and easily access learning materials and their own notes, and be able to add reflections, etc. Some sign-off forms (DOPS) will be available electronically on the iPads allowing clinical teachers to assess students and submit the DOPS to the Faculty Education Office electronically, keeping a record on the students’ iPads. Students will be able to participate during lectures using virtual clickers hosted on their iPads. Students will access interactive iBooks in the area of Obstetrics & Gynaecology. Students will be able to receive updates from different sites directly on their iPads providing a direct communication channel with clinical sites. The iPad pilot launch event took place on 15 May 2013 .